I have had some pain and swelling recently in my foot, and was praying God would heal it. When my pain got to maximum tolerance, I headed for my physio to get assessed to see what was going on. Initially, it was thought that I had irritated a tendon, because the symptoms fit. It turns out that it was actually my ankle. I apparently have a “locking” problem where my ankle locks, and due to gravity the swelling makes its way down on to my foot. You could treat the foot all you want but without treating the underlying cause of the ankle jams, it would be like running on a hamster wheel. A never ending cycle. Some of us are just like that with some of our past issues. We think that if we did such and such, we would see a different result moving forward. And because we miss the underlying cause, we fail to see the change we are truly longing for, aren’t we? You might think that you only have a surface concern to be addressed, and God is trying to get your attention focused on the deeper root. 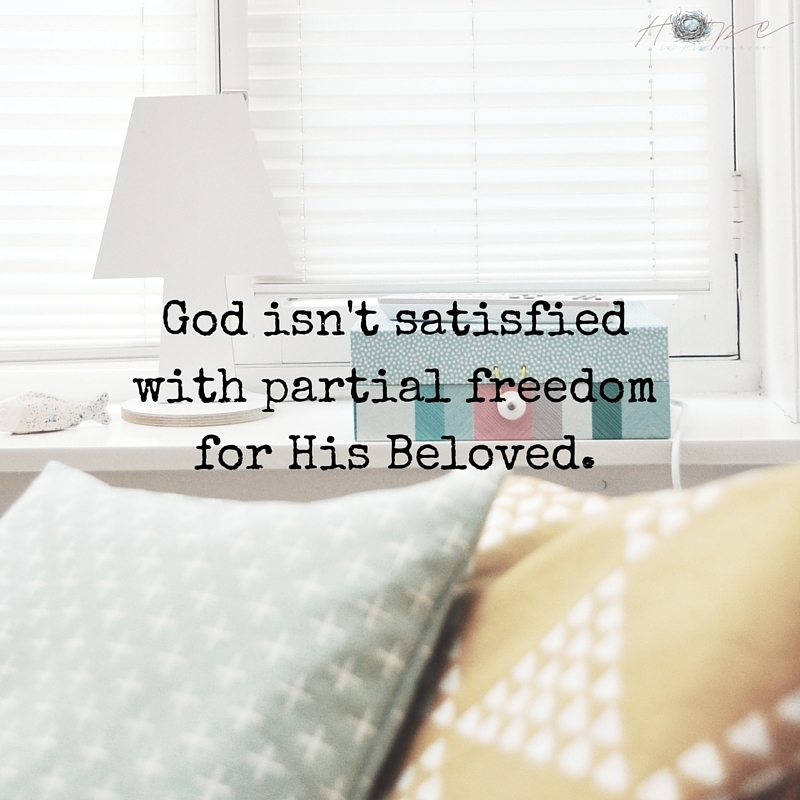 For God isn’t satisfied with partial freedom for His Beloved. He wants all of her, whole. Without shackle, ties or chains holding her back. Without shame, loneliness or guilt. Able to fully receive His love, walking as He leads – fearless, relentless, blameless – all in, holding nothing back from her Groom. He wants us to live in the tension of the supernatural reality that we are almost home, right now, Beloved. Despite the reality that the world tries to show us. 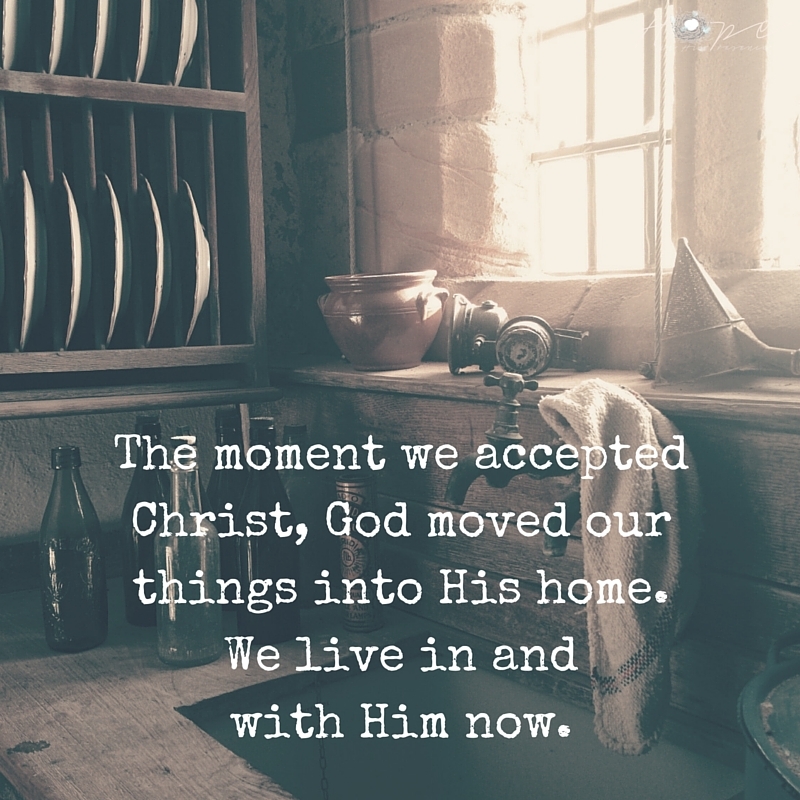 The moment we accepted Christ, God moved our things into His home. We live in and with Him now. AND NOTHING, BELOVED, WILL EVER CHANGE THAT TRUTH. EVER. Even when our feet swell, the washer dies, bills pile up and hard words suddenly slam against our soft hearts. Even when we cannot see the truth for the walls we have built to try and keep ourselves safe in this difficult world. 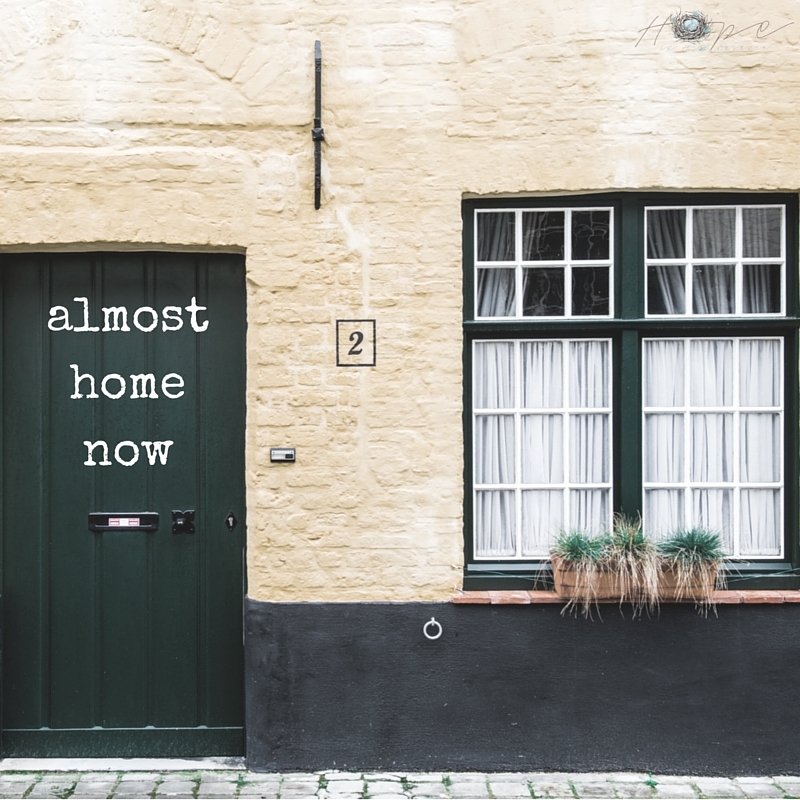 God has continually used the following song to remind me of His fierce love for me, and the truth of my life with Him -in the here and now, and the yet to come. He is with us through every single moment we spend here on earth until we are forever united with Him. He is our literal Home here right now and always and the forever Home we have to look forward to. Because with Him? We are almost home, for He is our Home. God with us, now and forevermore! May He bless you as you choose the freedom of His loving embrace, and soak in the truth as you believe you too are almost home now! 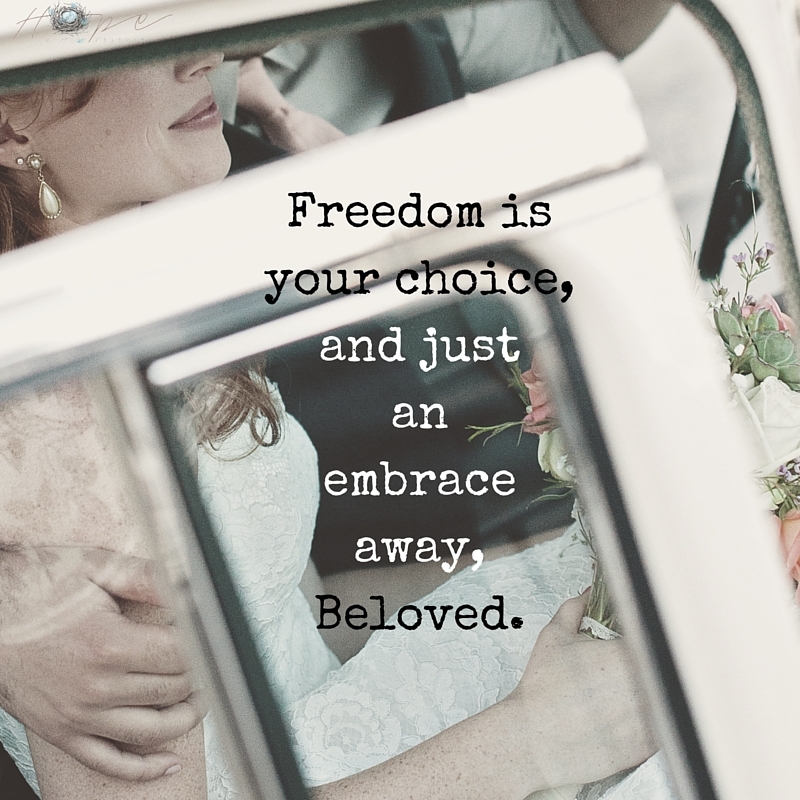 Freedom is your choice, and just an embrace away, Beloved.